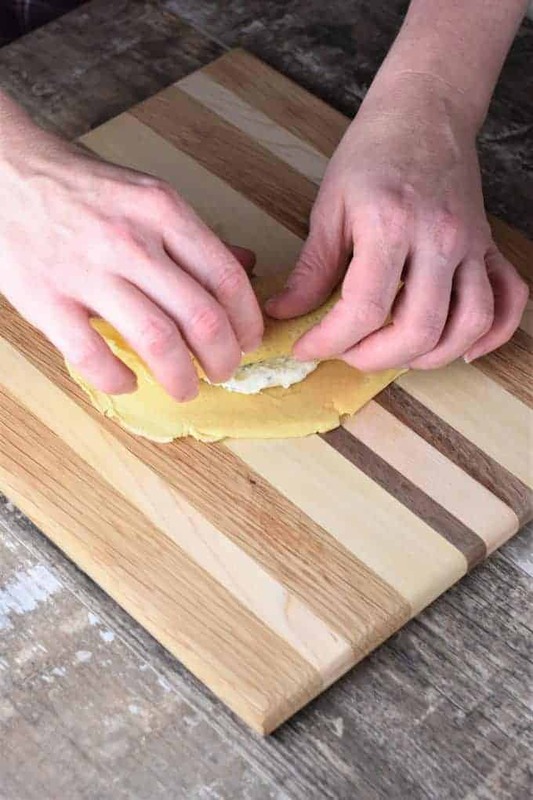 This Chickpea Flour Homemade Manicotti is a cheesy, hearty and deliciously satisfying Italian meal the whole family will love. OK, maybe not Thanksgiving. But it felt like we were the only ones having Italian food during the holidays while all of my friends were eating ham. Trust me, I wasn’t complaining. I’ll take some pasta oozing with three kinds of cheese over ham any day. Growing up, I definitely ate my fair share of Italian food. My dad is 50% Italian and taught me all of his family recipes…well, almost all of them. He can’t seem to find his grandmother’s recipe for knot cookies. I remember visiting my her as a child at her row house in Newark, New Jersey. I have no idea why, but I called her “Big Grandma.” She lived in a very Italian neighborhood. In fact, instead of an ice cream truck, an Italian ice truck visited her street in the summer months. That truck had the best chocolate Italian ice! Anyway, Big Grandma grew lots of delicious herbs in her driveway garden, cooked monstrous pots of homemade sauce and baked the most delicious Italian knot cookies one has ever tasted. I hope one day my dad finds the recipe so I can revamp it to be gluten-free like I did with this manicotti. To be completely honest, I never thought I’d end up making this by myself. Since it was my dad’s signature dish, I kind of enjoyed having him make it for me. The whole process just seemed so tedious. I didn’t realize it was actually pretty easy until I finally broke down and actually made it. After Greg adopted a gluten-free diet, and I later gave up modern wheat flour, I found myself in a pickle. How was I going to make gluten-free crepes (crespelle) for the manicotti and stay true to my dad’s original recipe? Enter chickpea flour. After trying out chickpea flour in other recipes, I knew this was the right flour for the job. It’s also a good source of fiber and protein as well as other nutrients, which to me, makes it even more awesome. So, I invited my dad over on Father’s Day to test it out! The result? There were just a few adjustments to be made to the measurements and bam! We had the best gluten-free manicotti of our lives! Even the kids were gaga over it! In fact, my eldest asked me to teach her how to make it. So, we made it together for this blog post. Now, we have three generations of manicotti-makers in the family! 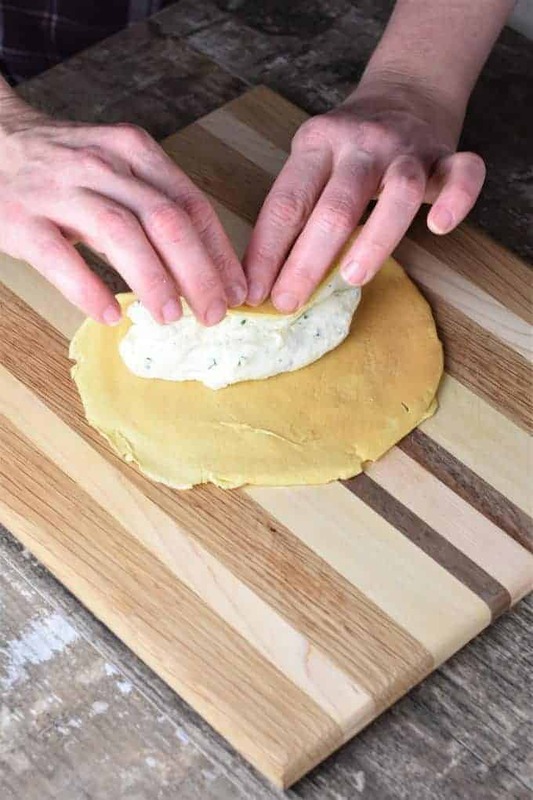 Start by preparing the ricotta cheese mixture and refrigerate until ready to use. Next, preheat your oven to 350°F. Lay out two sheets of parchment or wax paper on the counter. Now, prepare to make the crepe (crespelle) batter. 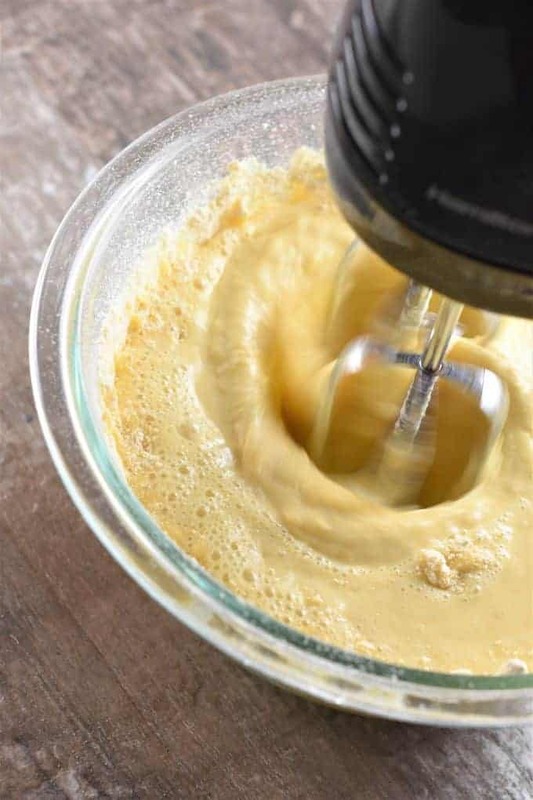 In a large mixing bowl, beat eggs and milk together with handheld mixer. Add chickpea flour and beat with handheld mixer until there are no lumps. Lightly grease an 8-inch nonstick pan by spraying some oil on a paper towel and wiping your pan with it. Heat pan over medium heat. 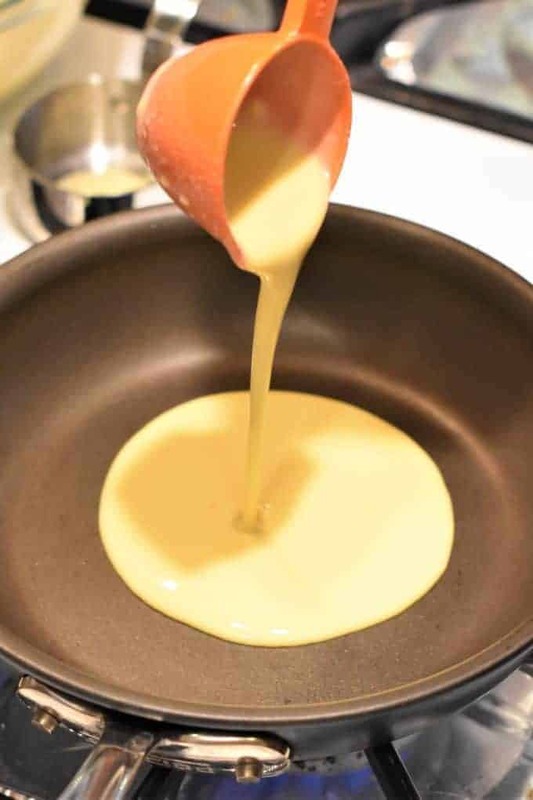 When pan is hot, add approximately ¼ cup batter to the center of the pan and swirl to cover bottom of pan. Cook until sides are set and start to separate from pan, middle should be almost set but not quite (approximately 15-20 seconds). 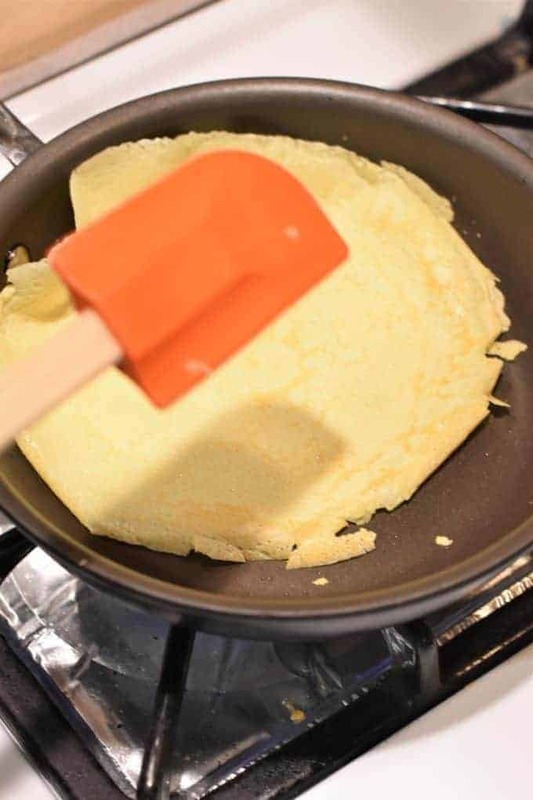 Carefully lift edge with spatula and quickly flip crepe over. Cook for 15-20 seconds more (crepe should be a light golden brown). 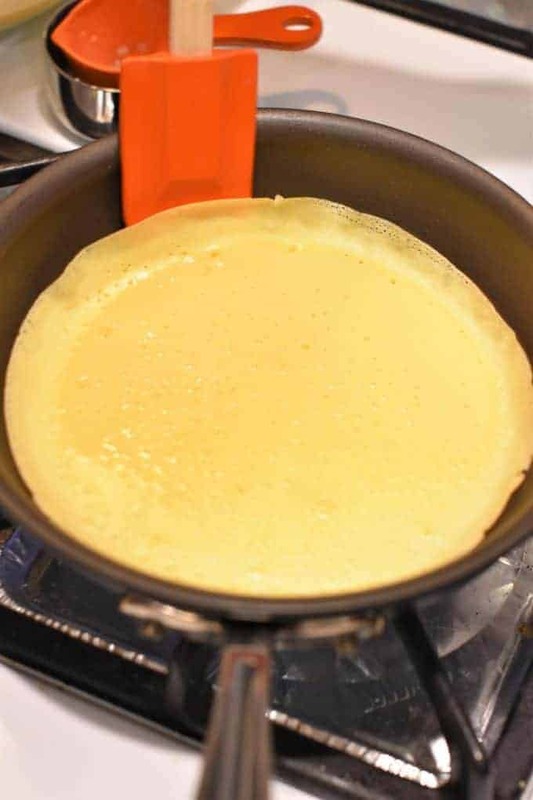 Use the spatula to remove crepe from skillet and place onto parchment or wax paper. Repeat with remaining batter, continuing to grease pan as needed until you’ve used up your batter. Once all the crepes are done, lightly line the bottoms of two 13” x 9” baking dishes with tomato sauce and set aside. 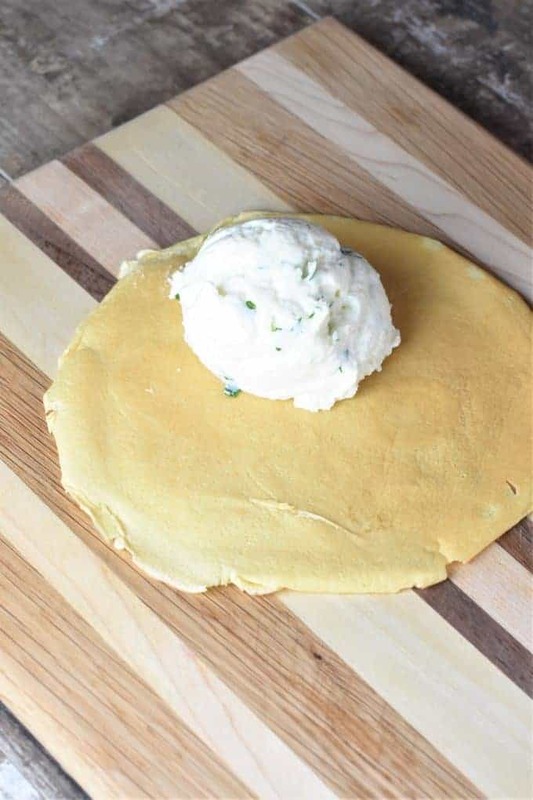 Add approximately ⅓ cup ricotta cheese mixture toward the bottom of one of the crepe shells. Press down slightly but don’t let cheese go past the edges. Roll up tightly and place seam side down into baking dish. 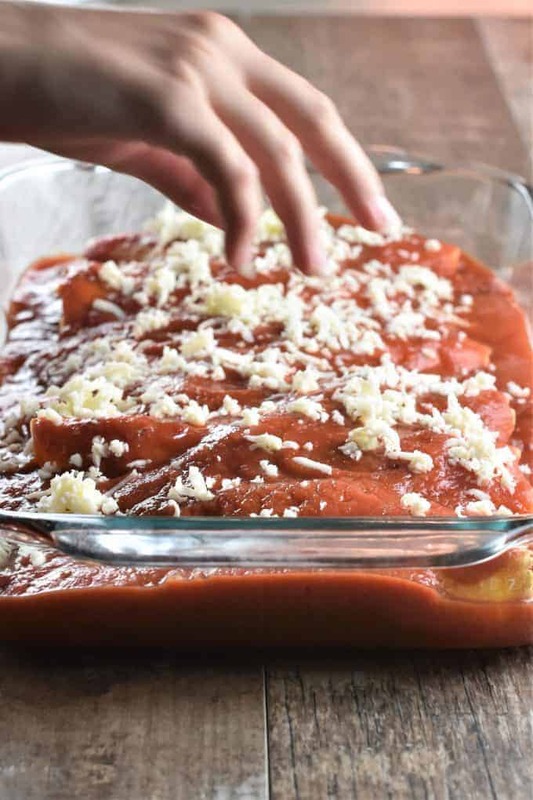 Once all the manicotti are in the baking dishes, top with remaining sauce and mozzarella cheese. Cover and cook for 30 minutes. Uncover and cook for 15-20 more minutes. Prepare ricotta cheese mixture according to recipe and refrigerate until ready to use. 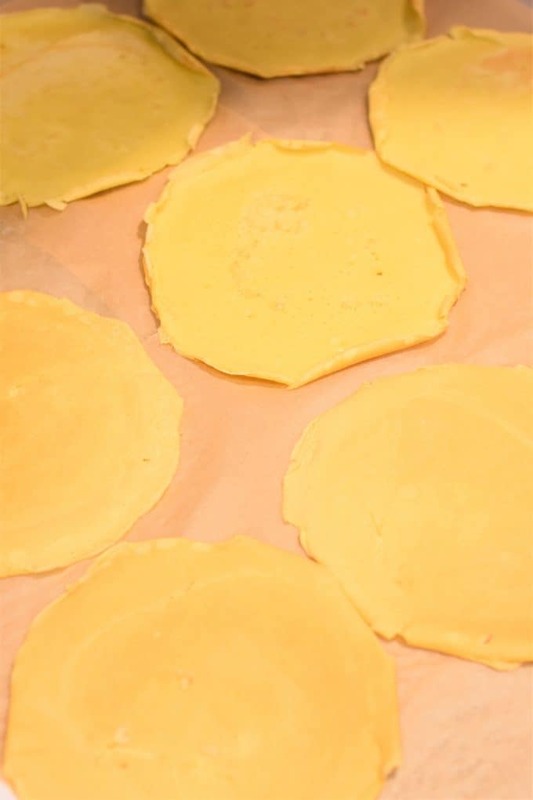 Lay out two sheets of parchment or wax paper on the counter. 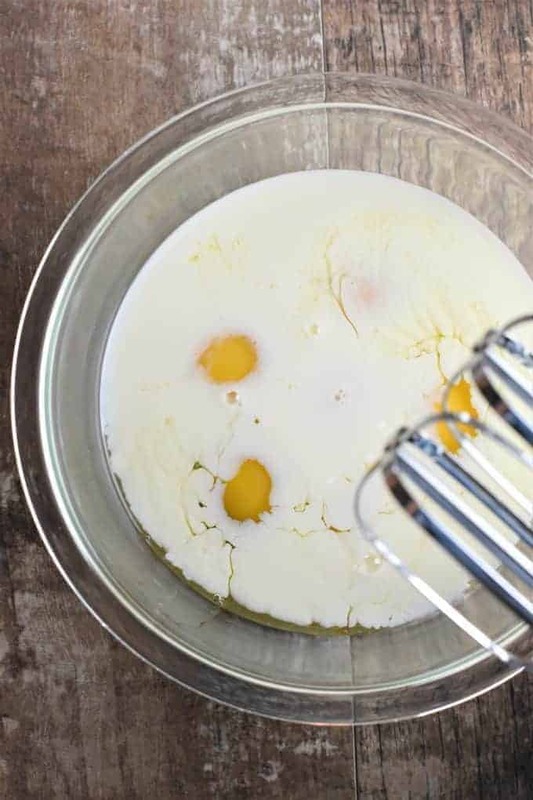 In a large mixing bowl, beat eggs and milk together with handheld mixer. Lightly grease an 8-inch nonstick pan by spraying some oil on a paper towel and wiping your pan with it. When pan is hot, add approximately ¼ cup batter (about 3/4 of a ladleful) to the center of the pan and swirl to cover bottom of pan. Repeat with remaining batter, continuing to grease pan as needed until you’ve used up your batter. Once all the crepes are done, lightly line the bottoms of two 13” x 9” baking dishes with tomato sauce and set aside. 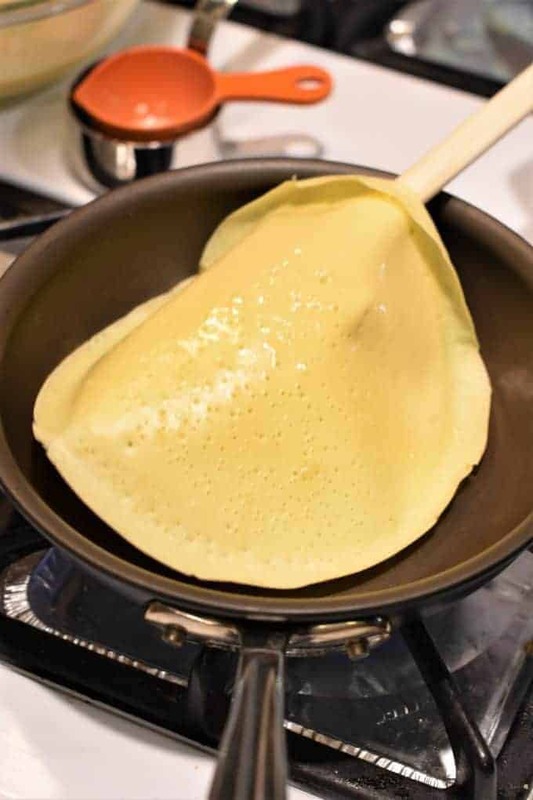 Add approximately ⅓ cup ricotta cheese mixture toward the bottom of one of the crepe shells. Press down slightly but don’t let cheese go past the edges. Uncover and cook for 15-20 more minutes. For step by step photographs for making the crepes, please refer to the blog post above the recipe card. 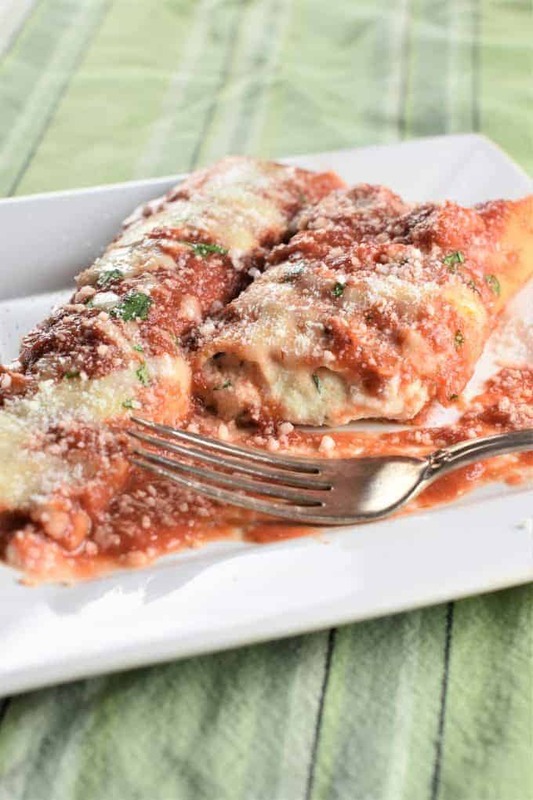 To make this manicotti vegetarian, replace the Pecorino Romano cheese in the ricotta cheese filling with with vegetarian-friendly Romano or vegetarian-friendly Parmesan cheese, and ensure the mozzarella and tomato sauce being used is also vegetarian. Pure comfort food! Perfect for pasta night. These look great, so incredibly comforting. I agree chickpea flour is great for so many things.